Feedback ~ Criticism or Opportunity? “Feedback is the breakfast of Champions” or so says Ken Blanchard. But I’m wondering how many of us truly have an appetite for it. Oh, don’t get me wrong, I, like many of you, believe that feedback is an important element in learning and growth. But, (and there is one) I think it has a way of feeling like bad news a lot of the time. 1. For personal growth in learning how others see us. After all, we only see ourselves from the inside out. The value of having others observe us and give us information about what they see is undeniable. Information about ourselves gives us a chance to make changes that have some personal meaning. I think the hardest part about making change is the commitment it takes to sustain new behaviour. Knowing why a change is important helps us to remain on course and raises the potential for experiencing positive results from our efforts. Feedback becomes a gift when it is presented sincerely and without judgment. As well, when it is given as part of a conversation rather than a laundry list of things to fix, it is more palatable for the receiver and allows for deeper understanding on both sides. Sitting down with someone once a year to talk about performance and outcomes does not engender an opportunity based perspective on feedback. Instead, it becomes something one dreads. Having daily conversations with people and making daily observations about their activities facilitates good and useful exchanges of information. Who is not familiar with this? Its starts by saying something positive; ends with something positive and then sandwiches the not-so-good stuff in between. I personally don’t like this approach because it feels contrived. And, by the way, no one is fooled by it. In my experience, people who say nothing during a session that includes personal feedback can have plenty to say when the session is over, and to people who can only serve to commiserate. While this might feel good at the time, it really isn’t very helpful. Participating in the conversation means asking questions. It sometimes means disagreeing and challenging. But it also means there is opportunity to understand as well as to be understood. That alone has great value. 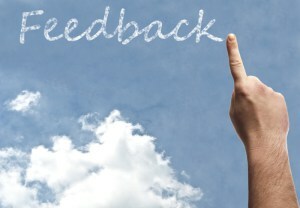 So, what are your thoughts about giving and receiving feedback? What is your experience with it? What would you add? Oh, and just in case you want to learn more, try reading Joe Folkman’s book, “Turning Feedback into Change” It’s a useful reference book for those who want to better understand the principles around personal development and making change through feedback.